With the advance of sensor, mobile, and Internet of Things (IoT) technologies, vehicle and passenger trajectories are increasingly being collected in massive scale in urban space. Trajectory data provide rich information on how people move around a city at various spatial and temporal resolutions, emerging as a critical source of insight into network traffic dynamics and traveler behaviors. This research explores and applies a wide range of trajectory data mining techniques—and develops new algorithms—to discover meaningful patterns in movement data to improve our understanding of individual and collective behaviors of moving objects in various transportation systems and contexts. Soltani Naveh, K., Kim, J., 2018. 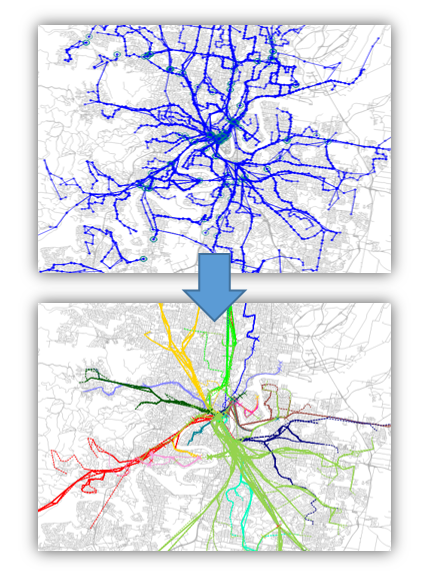 Urban Trajectory Analytics: Day-of-Week Movement Pattern Mining Using Tensor Factorization. IEEE Transactions on Intelligent Transportation Systems (in press). Kim, J., Mahmassani, H.S., 2015. Spatial and Temporal Characterization of Travel Patterns in a Traffic Network using Vehicle Trajectories. Transportation Research Part C: Emerging Technologies, vol.59, p.375–390.